Of similar size and mass to Earth, Venus is sometimes considered its sister. The similarity stops there, however, and little is known about the evolutionary processes that created this peculiar planet. Second planet from the Sun, Venus is also the hottest in the solar system with its exaggerated greenhouse effect creating mean surface temperatures of 480°C. 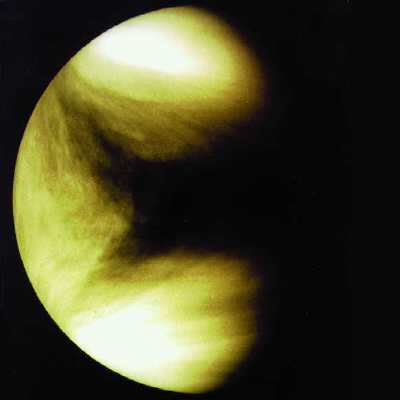 Global view of Venus swathed in clouds stretched by the high winds, courtesy of NASA. Its carbon dioxide-rich atmosphere is so thick that atmospheric pressure is 90 times that on Earth. Droplets of water and sulphuric acid form layers of mist and cloud 30 to 70 kilometres above the surface, concealing everything below. 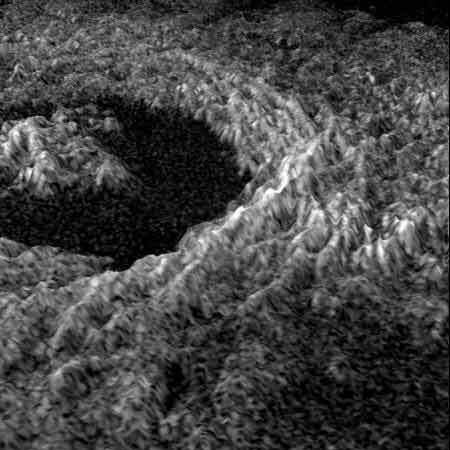 Venus’ 34 kilometre-wide Golubkina crater. Studying the number and size of such craters enables us to determine the age of the planet’s surface—in this case, just 500 million years old. While 80% of Venus is flat, parts of its surface reveal a turbulent past, with long, deep canyons, mountains higher than any on Earth, volcanic domes, lava flows and meteor craters. Venus rotates very slowly, probably because it has no magnetic field, and in the opposite direction to most planets. Its atmosphere revolves 70 times faster than its surface, creating equatorial winds in excess of 300 kilometres per hour. Etymology: in Roman mythology, Venus was the goddess of gardens and of love and beauty. Distinctive feature: Venus turns backward on its axis, in the opposite direction to all its fellow planets. It completes a full turn once every 243 days. Typical one-way journey time using current technologies: 5 months.